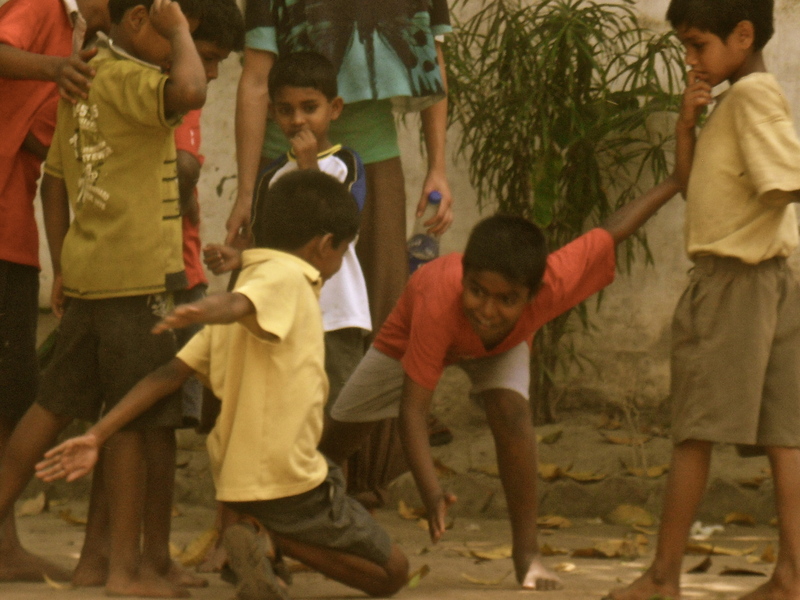 The Kids of Kolkata. By Imly Rice. From the crammed and tiny classroom at Children of Topsia to the rural but still jam-packed home of Bachpan, Performers Without Borders has certainly made an impression on Calcutta. The main part of our project here has been with Future Hope – PWB’s third visit to this fantastic and every-growing organization. They are currently working on plans to build a new home and school complex outside of Kolkata, to home and teach up to 300 children at risk. Although we could not spend the whole month with Future Hope, the children nevertheless learned so much in the time we had with them. The older boys (many of whom fondly remember our first visit in 2007) were very keen on acrobalance this time around, as many of them are budding sportsmen they are keen for new ways to use their strength and agility. For many of the younger members, it was their first experience of circus – and still many of them had favorite skills after the first 2 days! Everyone’s skills progressed quickly – we were met at the gates with ” Diabolo today Aunty?” – or, at the boys home, by one grinning face just seen over the top of the gate ” I’ve been practicing (unicycle) since i woke up”. 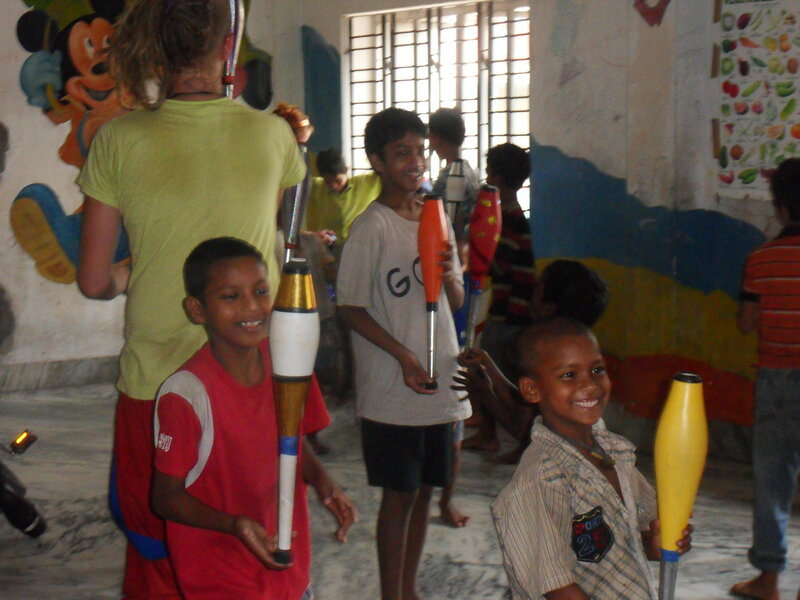 Eager for new skills and to add to their existing ones, PWB have left a new generation of circus enthusiasts at Future Hope this year, as well as further encouraging existing talents. 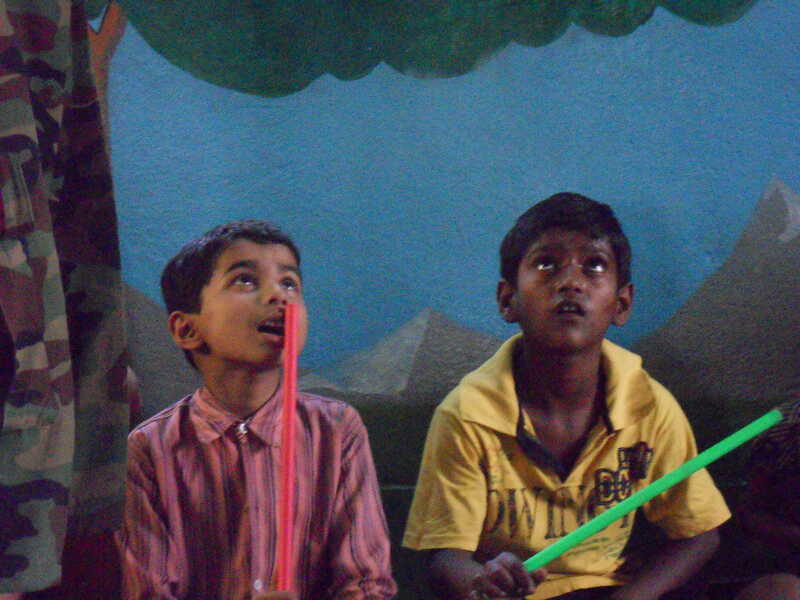 The older boys have already been performing their circus skills – at a yearly “Mela”, which they have plans to perform at again this year – as well as at some smaller Future Hope events. Having achieved this in minimal time and maximum heat (it is hitting 37 degrees at the moment), we visited 3 different Cini Asha centers – 2 shelter homes, one for boys and one for girls, and a drop in centre at Sealdah train station. Our audiences at these centers were small but perfectly formed – the children were full of smiles and excitement and we couldn’t have asked for better audiences for the first outing of our new show. In the boys shelter a couple of the boys had taught themselves to juggle, which throughly impressed me. We had time for a quick “have-a go at circus” at the shelter homes, met with laughter and and enthusiasm as unicycles were fallen off of and acrobalance moves achieved. As we leave the heat of Kolkata for a short break, and then on to our final project in the cool mountains of Darjeeling, my final thoughts are of the many smiling eager faces that we’ve met here, and just how excited they all were to learn, to have a go, to try new things that (some of them) had never even seen before! And that’s something worth remembering – for us all maybe – the excitement of trying something new, the thrill of trying, and finally, the satisfaction of learning. Since arriving in Mumbai on 2nd January 2012 fresh off the back of a new year hangover and into the disorientating sights and smells of India, one realises how far the whole team has developed and along with it the show and teaching. On personal levels we have overcome many obstacles, spending hours in meetings debating various subjects including the curriculum and whether or not the children were benefiting the best they could from the workshops we had created and working on what positive changes could be made to make them better. Part of making our workshops better was improving on a personal level skills we were not too familiar with. An example of this is Charlotte who having only recently learnt to hoop is, as I write, practicing new hoop moves and routines on the roof of our hostel, so that she can advance her teaching to the children of Future Hope, Calcutta. The personal aims and objectives of the group are essential on the tour in keeping things fresh and the pleasure we get from achieving our objectives rubs off on the children we meet along the way. Each person has been on hand in their expert field to lend a hand to others in the group that want to learn. Our resident contortionist Jess, has been leading stretching sessions to improve flexibility and handstand classes, unfortunately I still can’t twiddle my moustache with my toes but i’m working on it. Emily however is having far more success with her bridges and I hasten to add has perfected her pirate impressions! Whilst Gottfried has perfected his handstand and has never looked back, literally, he only see’s the world from an upside down viewpoint these days! Tom and I have also been leading some clown and voice workshops to improve both presence and projection on stage and in a noisy classroom full of very excitable children. Many of us and the residents of Calcutta were shocked at how loud we could really be, even our very own softly spoken Leo created noises Mr Pavarotti would be proud of! I think what we have all found out is that it is never too late to learn and if you think you can’t do something you just needed someone to show you and push you to learn, which is indeed what all this learning malarky is for, to make us realise what it takes to learn these skills and use our experiences to pass on to the children we teach. …and what have I learnt I hear you ask? Well firstly that if you jokingly tell an Indian child to unicycle into town to get you a veg sandwich they will most definitely take you seriously…practice makes perfect though! …AND that the only alarm clock you need on tour is the Tom trumpet fart, triumphantly on time, every time (it’s a sensory experience). But aside from that I come away obviously frustrated at not being able to complete the tour but thankful to all the children I have encountered that have enlightened my experience, thankful to all the team and new found friends for teaching me new skills like unicycle and club juggling that I have been able to pass on to the children and for being a joy to work with I will miss them all and of course thankful to India for showing me the struggles, the joys and the damn right bizarre and of course that ‘sab kuch milega’ (anything is possible). One of the highlights of my tour is definitely the call and response phrases the children responded to so well, little did we know that messing about in a Mumbai hostel mimicking the traffic below would lead to “Honk Honk Ding-a-ling” being shouted from passing cars, rickshaws, bikes, trains, houses, schools from everywhere we have taught and it’s like a little piece of PWB stays with them until next time, it never ceases to make me smile…even from my sickbed…or was that just the stomach cramps? PWB are a symbol of hope for the children we have met and are yet to meet in Darjeeling and for as long as you hear “HONK HONK DING-A-LING” that little bit of hope, spark, magic whatever you want to call it will reappear and that’s enough for me to go home with…until next time… shabadabdaba… doobiedoobiedoobie…honk honk ding-a-ling… KABOOM! Ninja! And the art of becoming one. By Leo. Rules: Each Ninja Apprentice must take turns – Clockwise. The aim is to hit another Ninja Apprentice on the hand (arm does not count!). When hit, you’re out. You have one move to attack and you can attack in any direction. Anyone being attacked has one defense move. In between, you stay a statue- no false moves, no slacking when your position is hard on your thighs: You’re a Ninja remember! The last one standing is Master Ninja and is therefore naturally thoroughly admired and respected by all Ninja Apprentices. Sweeping in this week, the Indian festival of ‘Holi’,and a rare breath of fresh air gracing the heat of Calcutta and indeed the PWB team in the form of some very brave and enthusiastic young women at Sanlaap and I speak for everyone when I say we are certainly feeling the love! Sanlaap is a home based just outside the centre of Calcutta for young women and children who have been rescued from various situations involving trafficking, including prostitution. Due to the various court proceedings some of the women find themselves in and the trauma caused, they can find themselves confined to the Sanlaap compound for up to several years until they are ready and able to leave. Unfortunately during this time many of the young women’s families will not be in contact if they know the full circumstances surrounding them being at Sanlaap. Due to the stigma that still surrounds families in society, some girls cannot return to their families, so Sanlaap helps them build a new life for themselves. On arrival at the centre the PWB team, ready to perform the now world famous ‘Honk Honk’ show, were met with some very curious faces, that curiosity soon turned into a chorus of ‘shabadabadaba, doobeedoobeedoobee, Honk Honk ding-a-ling’ and the rest of the show was met with equally loud woo-ing, laughing and clapping! I don’t know what preconceptions I had before visiting the centre but they were all blown out of the water from the very first minute. Their eagerness to engage in our performance and in our afternoon workshop was refreshing and created a very different energy to what we had been used to from the outreach work before, mostly due to teaching just girls as opposed to having mixed groups, which meant the girls being much more open than we had previously experienced. Already you could see the bond they had made with each other as one was encouraging the other to try all the different skills available without the thought of embarrassment of falling off the unicycle (usually I have to look silly and ‘pretend’ to fall off for the kids to try it) but these girls were loving the trying, the failing and eventually the succeeding! After the first day of teaching it was hard for me to imagine what histories these young women had or what kind of trauma they still went through, simply because of their playfulness and desire to learn and I am happy not to know as long as I saw those smiling faces again in the next two days of our short visit. By the end of day two it was game sharing day, we taught them the game of ‘ninja’ one of Leo’s finest games (I will tell her to write the rules for anyone interested at home) and they taught us the traditional Indian sport of ‘Kabaddi Kabaddi’ normal rules apply (google it) or though with the added Sanlaap girls rule of no nail scratching and let me tell you now, don’t be fooled by their sweet little faces because they wont hold back, even if you are a beginner! I wasn’t scared though…honest! One of the skills they seemed to thrive on was acrobalance. It was hard for us to hold them back, especially once they found out they could make a sequence to show on our last day. Some of the moves they made up were hair raising to say the least and even surprised our very own bendy Jess! After a few adjustments and a “safety dance” or two our heart rates were restored and the final performance was quite simply magical. And it was watching them show off their new skills learnt from PWB that leaves me with nothing but maximum respect for them. We will never know the reason why some of the young women have landed at Sanlaap but that is not what PWB are here to find out about, on any of our projects. It’s about how we can help in the here and now, not to worry about the past (as too many of us do) but to live in the present, looking forward to what the future brings. What is important is that we take them at face value and do what we (PWB) can to help them realise their own potential and hope that they manage to achieve their ambitions in life. It’s March already and we’ve just finished our first week in Kolkata. The weeks are passing by so fast, it’s crazy! We’ve done so much and still have lots to learn and experience. I’m loving every minute spent with the kids we’ve been working with. After a short break it was great to have the team back together and bring some exciting PWB-ness to new places and faces. We spent our first week here doing outreach work at Ninos del Topsia- a school for children of the slums. 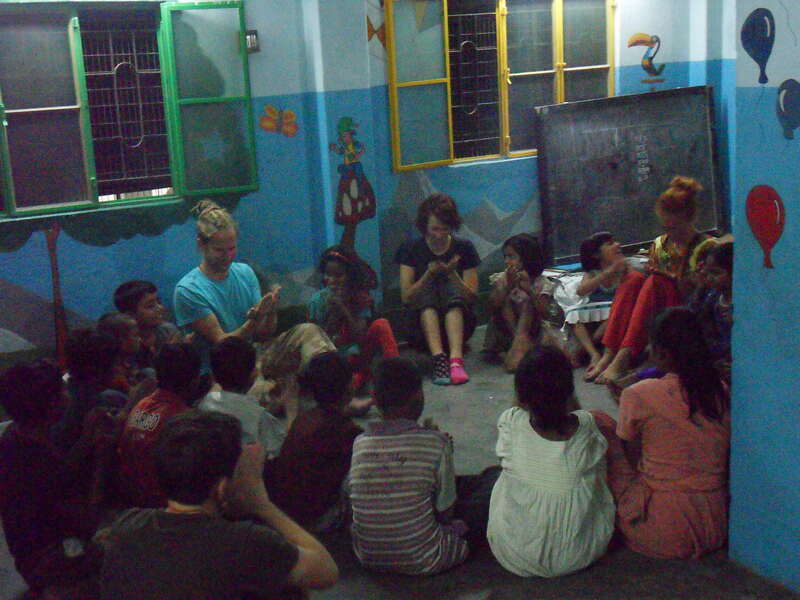 Although we spent just three days doing workshops after school, the amount they learnt is incredible. The classroom didn’t have much space, so the skills we could teach were limited, but we played lots of theatre games which went down well; the whole group got really involved. It’s so much fun getting the chance to see all these kids being silly as well as playing with devil sticks, being creative and working together. We even managed to squeeze some acrobalance moves in. There were kids piled right up to the ceiling. For our last workshop we put together a sequence of their new skills for everyone to perform. 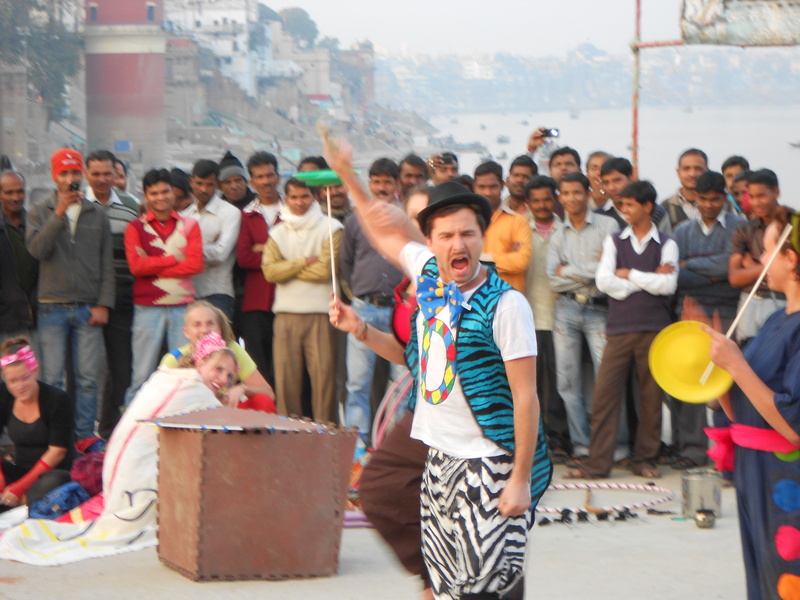 The next day when we arrived to do the show, the park was full of acrobats practicing in their groups. Some even invented their own moves! 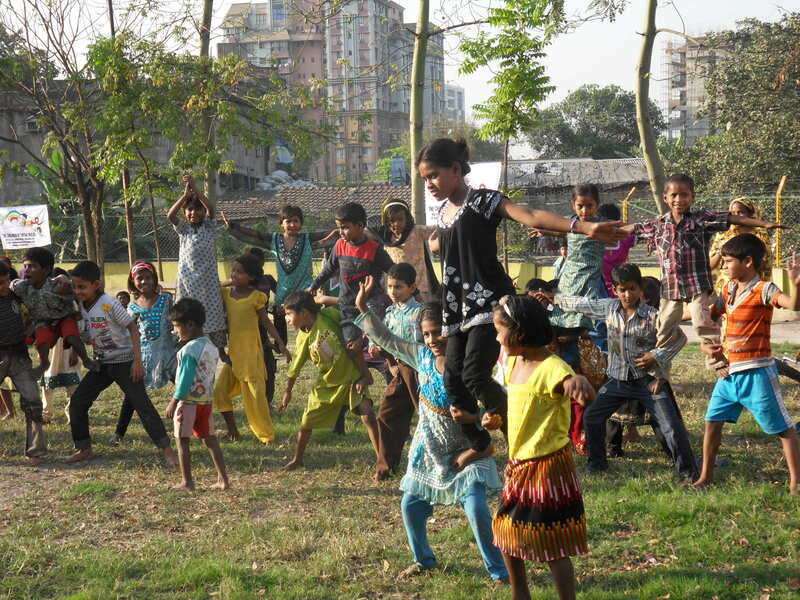 All the children we taught got to perform to an audience including people up trees, on rooftops, each other and us. It made me so happy to see so many children enjoying something that as a child and still now has always been one of my favourite things to do. I’m so glad to have the chance to share it with amazing kids! You are currently browsing the Performers Without Borders blog archives for March, 2012.